NOLS volunteers raise the bar …Again! On September 27th NOLS (the National Outdoor Leadership School) volunteered at Little Mountain Park, for their third year in a row! Their impressive work helped to ready our trail called La-Z-Boy for the "Symphony Run" over the weekend. Their work also helped to ensure improve trail conditions as our weather worsens. NOLS continues to set a solid example, one we hope that other groups and organizations will follow. They reached out to us, asked how they could help - and as always exceeded our expectations. 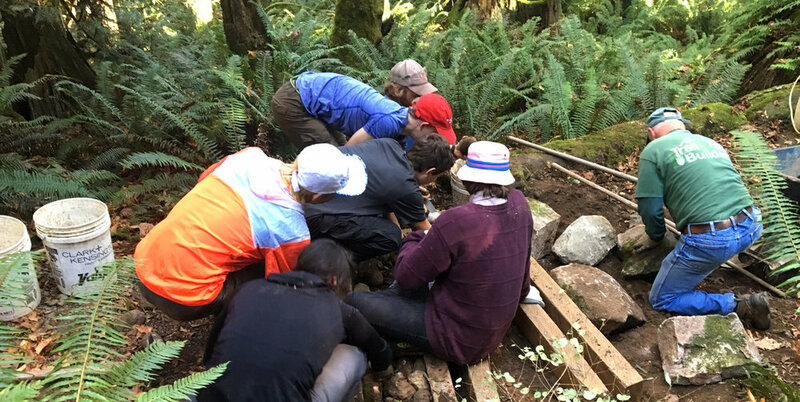 NOLS students and instructor helping build slot drains. Another NOLS team clearing a channel for water above the slot drains. Not shown, but also completed, was trail tread shaping, building of rock walks, and bridge maintenance. THANK YOU NOLS! So what's next? Expect a few important announcements over the next few weeks. And yes, at our next volunteer session on 10/22 the work of blowing leaves off trails begins. If you'd like to get involved please contact us!